A community member's dog acts like he's the boss, and this is a common problem for owners whose dogs display dominant behaviors. Find out how this owner can regain his place at the top of the pack order. My Miniature Schnauzer thinks he's the dominant one. He doesn't let me play with my other dog, and he bites us both. What should I do? Biting is never acceptable so we need to get your family pack back on track very quickly. 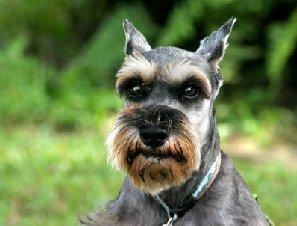 First, you need to establish your own dominance over your Schnauzer in a fair but firm way. Putting the two of you through an obedience class is the easiest way to start the process in a controlled environment. You're actually putting your dog on neutral territory, so this should immediately take away some of his bravado. All of the obedience exercises are designed to teach your dog to watch your lead and follow your commands. This is a great way to establish dominance without winding up in a combative position with your dog. You will naturally transfer what you learn in class to your home life, and this is where your dog's challenge will most likely take place. It will be up to you to demand the same kind of obedience at home as you do in class. Your dog needs to learn that you are the full-time pack leader. If he tries to bite you or your other dog, give him a very loud, firm "NO" command, and follow up with "Down" command. If he learned his lessons well in class, this will immediately put him in a more submissive position. Tell him to "Stay," and then walk away. The idea is that he doesn't get an attention reward for bad behavior. I believe that following this advice should firmly place you at the head of your pack and resolve your dog's aggression issues. Best of luck with your situation. I have a female one-year-old Malipoo. She is exhibiting aggression towards me when I take something away from her that she wants and can't have. She growls and then puts her teeth on me. What can I do to stop this behavior? It sounds as though your dog has taken the Alpha position in your home. When you take away her item, she actually believes she is correcting you. You have got to establish yourself as her pack leader in order to put a stop to her aggressive behavior. Nothing works better for this than enrolling the two of you in dog obedience training. During training, you are put into the leadership position in every instance, and this will teach your little Malipoo who is the real boss in your pack, yet do it in a kind and positive way. The beauty of this training is that not only will it cure her aggression, she'll also become the model pet. If full training isn't practical at this time, you can try getting the situation in hand at home. First, you have to tell her "No" very firmly as you take the item away from your dog. Since you only describe her as "putting" her teeth on you, and not actually "biting" you, I'm assuming that your dog is bluffing a bit. This makes things a little easier to work with. Once you have taken the item away, you have to follow through with the correction by putting your dog in the submissive position. This involves making her lie down on her side with your hand gently against the side of her neck. She is a small dog, so be careful not to apply too much pressure or you might cause an injury. When done correctly, this move is not violent in the least. Keep your dog in the submissive position for a couple of moments until you can actually feel her body relax. When this happens, it's like she's saying, "Okay, you win." Repeat this procedure every time she offers rebellious behavior and you will soon establish loving dominance over your wayward pup.